‘Pedro Ximénez’ is a native grapevine cultivar from Córdoba province (Andalusia region, southern Spain), which has been seriously affected by fungal trunk pathogens causing general decline along the last decade. However, the occurrence of grapevine trunk diseases (GTDs) in Andalusia region has not been studied yet. Therefore, the main goal of this study was to evaluate the occurrence of GTDs affecting ‘Pedro Ximénez’, and to characterize the causal agents by morphological and molecular methods. Between 2016 and 2017, 25 commercial vineyards of cv. Pedro Ximénez showing decline symptoms were surveyed. Fungal isolations were done and 23 representative isolates of the fungal trunk pathogens associated with the different GTDs (black-foot and Petri disease, Botryosphaeria and eutypa dieback, and esca) were selected according to colony colour and mycelial growth development. Colony colour, mycelial growth, and conidial characteristics were defined. The effect of temperature on mycelial growth was evaluated. Phylogenetic analyses of ribosomal genes (ITS) and functional protein regions (ACT, HIS, TEF, TUB) were preformed to confirm their identification. The especies Cadophora luteo-olivacea, Cryptovalsa ampelina, Dactylonectria alcacerensis, Da. novozelandica, Diplodia corticola, D. mutila, D. seriata, Eutypa lata, Fomitiporia mediterranea, Ilyonectria liriodendri, Neofusicoccum mediterraneum, N. parvum, Phaeoacremonium iranianum, Pm. minimum and Phaeomoniella chlamydospora were identified. Despite grapevine fungal trunk pathogens being well known in the main grape growing areas worldwide, this present study is relevant because it has been focused in the native cultivar Pedro Ximénez, improving our knowledge about aetiology of GTDs in southern Spain towards make decisions about management strategies preventing infections. Carlos Agustí-Brisach is the holder of a ‘Juan de la Cierva-Incorporación’ fellowship from MINECO. We acknowledge J. Portero and Á. Portero for providing valuable advice on the affected commercial vineyards by GTDs in the area of the PDO Montilla-Moriles. The authors thank F. Luque for her skilful technical assistance in the laboratory. Authors declared that this manuscript have not published elsewhere. All the authors have read very carefully and approved current version of this manuscript. All authors also declared that the data or images have not manipulated. This research is focused on identification of some fungi causing diseases on plants. This article does not contain any experiments with human participants or animals. 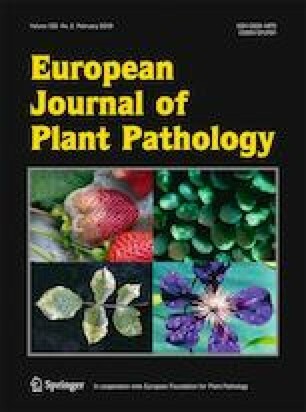 Please be informed that authors are satisfied to publish this work in European Journal of Plant Pathology. Larkin, M.A., Blackshields, G., Brown, N. P., Chenna, R., McGettigan, P. A., McWilliam, H., Valentin, F., Wallace, I. M., Wilm, A., Lopez, R., Thompson, J. D., Gibson, T. J., & Higgins, D. G. (2007). Clustal W and Clustal X version 2.0. Bioinformatics, 23, 2947–2948. MAPAMA, 2017. http://www.mapama.gob.es/es/agricultura/temas/producciones-agricolas/vitivinicultura/#para2. Accessed 04 November 2017.